Continuity mistake: Popeye goes to Bluto's ship. He finds his pappy there: he's tied to the chair hanging in the ceiling. Popeye gets excited, and notice that before he hugs his pappy he takes his pipe out of his mouth. When we see Popeye again, the pipe is back to his mouth. Too fast to be real. Continuity mistake: After Wimpy and the Undertaker grab things off the sideboard, Papa Oyl can be seen at the table in the mirror. As the camera cuts to the dining room, he can be seen coming to the table. Continuity mistake: As the octopus pulls the rowboat under at the end, you catch a glimpse of Olive's legs, although the octopus was not near her at the time. Continuity mistake: At the races, Wimpy has Swee'pea at the line up board, asking which horse to bet on. As Castor walks in, the shot cuts to Wimpy at the board. The number 7 slot is empty, and no attendant is there. As the shots alternate between Wimpy and Castor, there is an attendant behind Wimpy erasing slot 7, starting to write, then gone again after Castor goes by. In the next moment, Wimpy is directly in front of the board asking Swee'pea. After picking Holy Moley, the next wide shot has the attendant back again with a name in slot 7. Plot hole: The mysterious stranger brings the basket down with Swee'pea in it, and replaces Olive's basket with it. How can she have a basket painted to look like Olive's when she didn't know Olive had a similar basket of a certain color? Continuity mistake: At the beginning of the movie when the town is being introduced, the entire sign on the Oyls' house is crossed out. When Popeye goes to see about a room, only the S on the sign is crossed out. Afterwards, the entire sign is crossed out again. Continuity mistake: In the beginning, there's a citizen ringing the bell. If you look carefully, the church appears to lit by strong daylight, but it's supposed to be stormy. After the bell ringer is done, the light strengthens as if the ringing awakens the town. The lighting on the church doesn't change at all. Continuity mistake: When Bluto has the chain around Popeye, he squeezes the can of spinach open. Before he force feeds the spinach, Popeye has his pipe. On the close up, Popeye's pipe is missing. After his mouth is full and before he goes under, the pipe is back in place. Visible crew/equipment: When Nana Oyl is walking around the table and approaching the side board, the cameraman's legs can be seen in the mirror behind her. Other mistake: During the end of the movie, when Popeye sings the title song, if you look at the bottom right of the screen, you can see the runway type platform that he dances on until he goes off the end, and ends the movie. Revealing mistake: After Bluto knocks Popeye out and he falls into the water, Bluto goes to jump in after him. Watch the water. Popeye just landed, but the water is really calm. And when Bluto hits the water, it's right on top of a face-down floating Popeye. 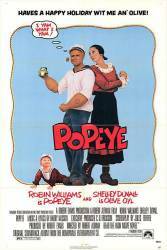 As Bluto hits, Popeye's body bends almost in half backwards, revealing that it's a foam rubber mannequin. Continuity mistake: When the octopus is trying to get Swee'pea, Pappy lowers the hook that had his treasure chest on it to save Swee'pea. One moment the hook is right behind him, and after a quick cut to Pappy and back, the hook is missing. Visible crew/equipment: After Olive threatens Wimpy, she goes to enter the Commodore's boat. When the camera is looking up the stairs to see her foot entering the shot, you see shadows playing on the ceiling and stair well. If you watch closely, you can tell that the shadows are of the camera man and the camera. Revealing mistake: When Popeye shoves the Taxman backwards, watch carefully. When the Taxman goes sliding down the ramp, just before he hits the water you can see the board that he was sliding on. Also, there is no motion from his arms, legs, or head. Continuity mistake: You see Wimpy pull out the racing form from his coat and then put it back in. After he leaves, Nana Oyl finds the racing form on the floor, but Wimpy didn't drop it. Continuity mistake: When listening to Olive question Swee'pea, and his answers, Wimpy goes to pull something out of his coat pocket. When the shot goes to the father, you see both of Wimpy's hands. When the camera goes back to Wimpy, his right hand comes out of his coat with the racing form. Revealing mistake: During the fight, Popeye ducks Oxheart's swings. If you watch carefully, it appears to be the same swing repeated multiple times from different angles. Audio problem: At the illegal fight, as Castor and Oxheart get ready to fight, Oxheart's mom says "Don't kill him. Just rough him up a bit." you hear the lines, but her mouth isn't moving. Continuity mistake: When looking at the storm clouds in the beginning, the sun can be seen peeking over the clouds at the far right side of the shot. Then, after a flash of lightning, the sun is not only completely hidden by the clouds, the clouds at that spot are now much higher than they were. Also, the sun's position suggested late afternoon, yet the movie opens in the early morning hours, when Sweethaven is beginning its day. Continuity mistake: After Popeye asks for an apology, the first guy grabbed offers his "hum-felt" apology, then gets thrown toward the door. After the shot cuts to see him go, there is a hat flying from his hand he didn't have.. The Tax Man: One sunflower, embarrassing the Tax Man tax. Wesley Ivan Hurt, who plays Swee' Pea, is the real-life grandson of Robert Altman, the film's director.